Prior to the start of this legislative session, Governor Kim Reynolds and Republican leaders in the Iowa legislature identified tax reform as a top priority. With Congress passing the Tax Cuts and Jobs Act in December, tax reform became an immediate priority for Iowa. While the Tax Cuts and Jobs Act reduced the federal income tax burden for many Americans, an overwhelming majority of Iowans who pay federal income taxes will likely see their state tax burden increase because of federal deductibility. Iowans have long been able to deduct their federal tax payments from their state income taxes. This has been a worthy taxpayer protection when federal taxes increased. Today, however, the roles are reversed and a reduced federal tax burden means taxes in Iowa will go up. In addition to fending off tax increases for many Iowans, the Governor and the Iowa legislature are seizing this opportunity to re-write the Iowa tax code and provide the first income tax cuts in 20 years. Governor Reynolds and the Iowa Senate have both released reform plans that would lower tax rates and simplify Iowa’s tax code in order to provide tax relief to most Iowa taxpayers. Senate Republicans recently passed their proposal. The Iowa House took their first step when the Governor’s tax bill was passed by Republicans in a Ways and Means subcommittee. The Governor’s plan calls for $1.7 billion in tax relief through 2023, focusing on reforms for individuals. The proposal would gradually phase out federal deductibility, lower individual income tax rates from 8.98 percent to 6.9 percent, and expand deductions for small business owners and farmers. Revenue triggers would be used to ensure state revenue increases before lowering rates. The Senate has offered a broader plan, calling for $1 billion a year in tax relief once fully phased in, through individual and corporate reforms. This proposal would repeal federal deductibility and lower rates; the top individual tax rate of 8.98 percent would be lowered to 6.3 percent and Iowa’s high corporate tax of 12 percent would be lowered to 7 percent. In addition, the proposal would reform and reduce Iowa’s complex system of business tax credits and further expand deductions for small business owners and farmers. Each proposal has merit and as the Senate and House continue to shape their respective legislation, lawmakers should ensure that any reform includes some crucial provisions to achieve successful tax reform. Perhaps the most important lesson is to understand tax relief and spending cannot be separated. North Carolina, Indiana, and Wisconsin have lowered rates without creating a budget crisis. Many opponents of the tax reform and relief proposals introduced in Iowa claim that these proposals will result in a fiscal crisis. 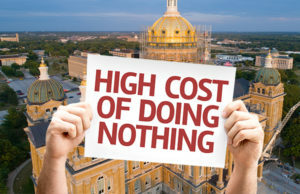 Iowa policymakers can avoid crisis by controlling spending and by utilizing revenue triggers, or otherwise phasing in rate cuts. “The supply-side effects of fiscal policy are real, but they don’t negate the need for spending discipline,” noted John Hood of the John Locke Foundation. New tax legislation in Iowa also should be comprehensive, reforming individual and corporate tax codes. North Carolina and Indiana are examples, again, of states that have lowered their corporate tax rates along with the individual rates to ensure that their tax codes are fair, simple, and encouraging of growth. Iowa’s corporate tax rate of 12 percent is the highest in the country and necessitates the existing complex system of tax credits. Iowa’s lawmakers should use this opportunity to reduce both the high corporate tax rates and the accompanying use of corporate tax credits. Governor Reynolds, along with many in the legislature, understand Iowa needs pro-growth tax reform. High tax rates are harmful to economic growth. In addition to reducing rates, the final tax reform and relief measure should be comprehensive, use revenue triggers or phase-ins, reduce and reform the use of tax credits, and modernize the sales and use tax to bring fairness to Iowa’s small businesses. By reducing tax rates and controlling spending, Iowa can provide tax reform and relief that will benefit all Iowans.